During our ongoing effort to simplify the products we use in and on our bodies, we delved into making toothpaste a while back. Our bathroom and kitchen are looking more and more similar, what with all the bathroom products we make now! 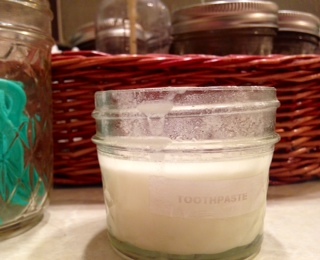 The toothpaste we came up with works really well and my teeth feel soooo good and clean after using it. We do not go to the trouble of sticking the stuff in a tube, and share the little pot of paste that lives on the bathroom counter. Some may not like the approach of double dipping with multiple brushes, but the stuff naturally has antibiotic properties from the coconut oil and antibacterial tendencies of the baking soda. We don’t worry about spreading cooties – in our little home cooties are going to be spread regardless of shared toothpaste. Each person could have their own little pot, if you get squeamish. The sweetener is optional, but makes the paste more appealing to Little B, so in it goes! There is no harm in swallowing the toothpaste, unlike the stuff from the store, for it has no fluoride. Swallow away! Combine baking powder, baking soda, tea tree oil, peppermint oil and sweetener in a small bowl. Add coconut oil and stir well. Place paste uncovered in a resealable container you will use in the bathroom. Let paste sit for a day – it will thicken and rise a bit. To use, scrape a small amount onto the bristles of a toothbrush. Wet brush and clean teeth as usual.